Discussion in 'Conspiracy Theories' started by Eden, Mar 3, 2014. 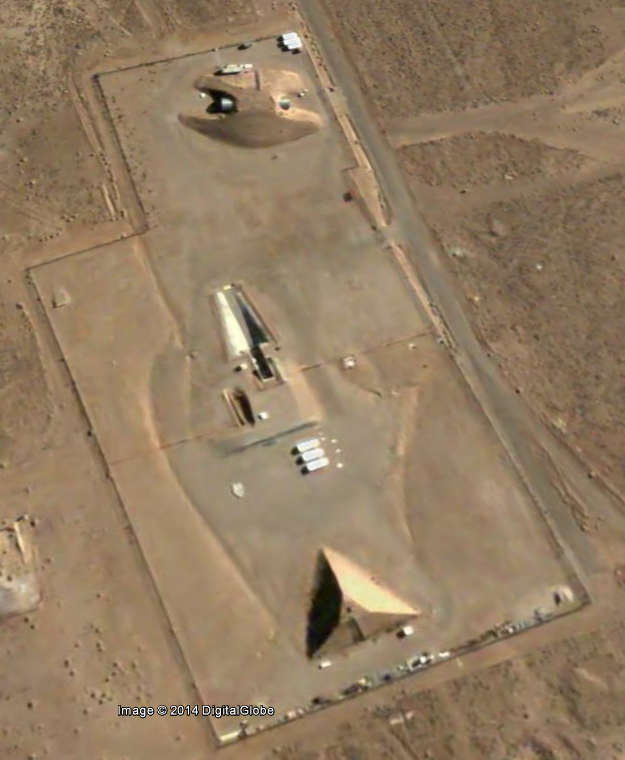 A number of sources on the web have, since the advent and increased usage of Google Earth and other services providing satellite images, reported that a "strange" pyramid of supposedly alien origin can be see deep within the boundaries of (and each of these descriptions have been used in reference to the location) Area 51/NTS/NNSS. To begin, let's do a little bit of disambiguation. As some of you may be aware, the term "Area 51" is often used indiscriminately and carelessly when referring to the Nevada Test Site (which is now known as the Nevada National Security Site). 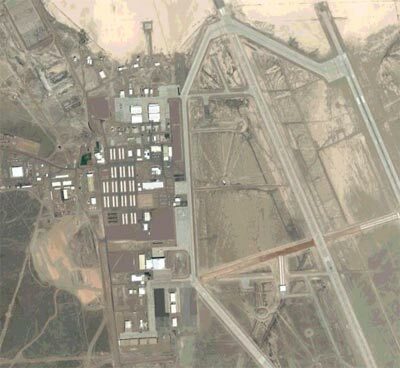 Area 51, whether or not the Government officially go on record to acknowledge the existence of a location with that name, does not encompass the entire NNSS, only a small part of it -- an airport and associated operations located near Groom Lake. With respect to claims made about a mysterious/alien pyramid, the object in question is not located in or near "Area 51"/Groom Lake. 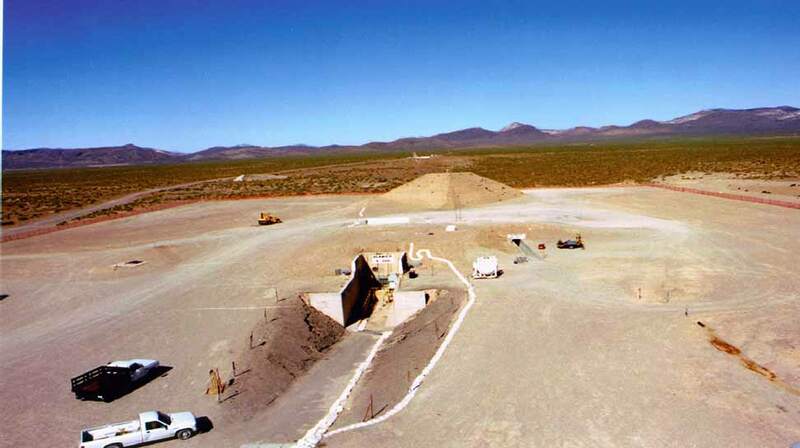 It resides with Area 4 of the NNSS, approximately 30Km south-west of Groom Lake. Note that this second image is taken from the most recent satellite images available of this area and as such, additional facilities have been added to the site since the photo above was taken. We find ourselves within Area 4 of the NNSS, a small region located north-west of the Yucca dry lake and west of Yucca Flat. In modern military engineering, berm has come to mean the earthen or sodwall or parapet itself. The term especially refers to a low earthen wall adjacent to a ditch. The digging of the ditch (often by a bulldozer or military engineering vehicle) can provide the soil from which the berm is constructed. Walls constructed in this manner are an effective obstacle to vehicles, including most armoured fighting vehicles, but are easily crossed by infantry. Because of the ease of construction, such walls can be made hundreds or thousands of kilometres long. The tunnel itself ends at a wall and is not an entrance to the pyramid as many conspiracy theorists have claimed. 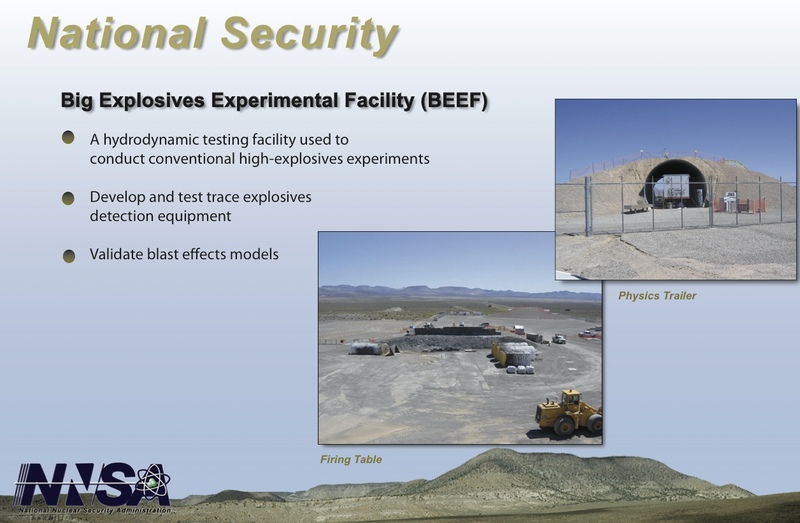 The site -- as explained in DoE documentation -- features an underground concrete bunker from the earlier days of testing at NNSS and it is precisely for this reason that this site was chosen to host the BEEF project. You can see the access tunnel to this bunker in the top/right of the image above. Edit: Removed duplicate text and images caused by a copy/paste after receiving a security warning when attempting to submit the original post. "Pyramids Globally Beaming Energy To Mysterious Space Cloud"
There are many more -- I don't recall seeing any mention of BEEF in the articles I've looked at, please let us know if you happen to see one. 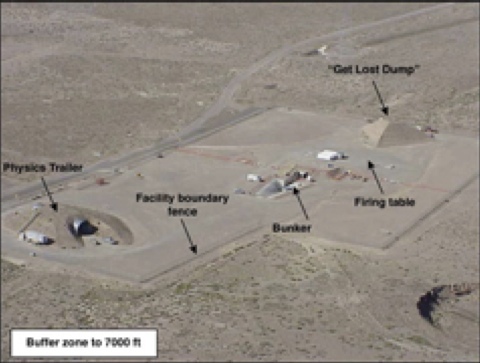 I want to work somewhere called "Big Explosives Experiment Facility"
Why connect the word 'alien' to a pyramid in the first place? Was there any weird activity associated with it or is it just an automatic 'Area 51 + pyramid = aliens'? More like "Area 51 = Aliens". 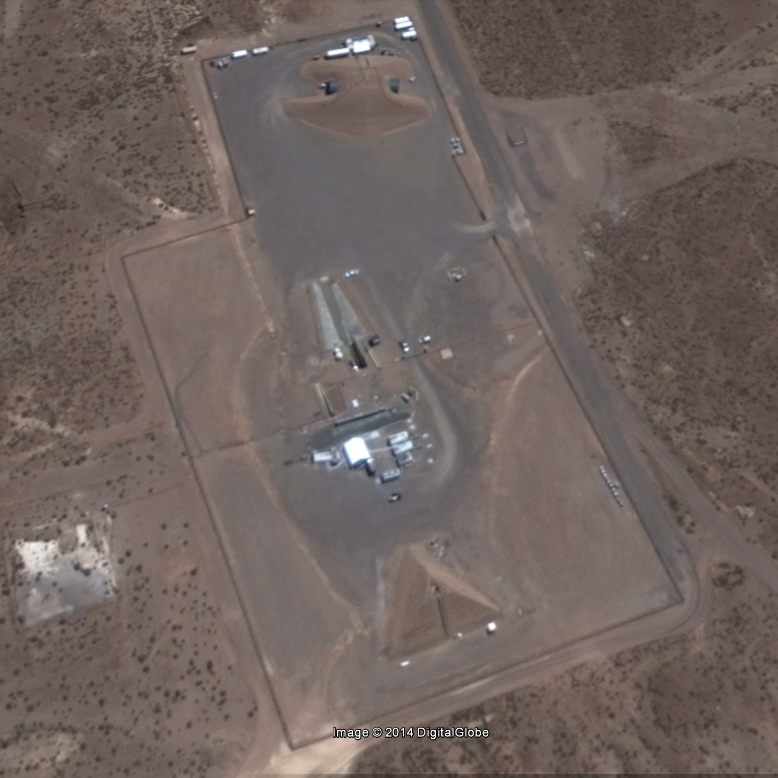 There are lots of conspiracy theories about either alien technology or actual aliens at Area 51. So anything odd there would automatically have an alien connection (if you give credence to the theories). After reading a few of the surprisingly in-depth hypothesis that people have offered (there are a couple out there than span 2 or more pages but don't even come close to identifying the "mystery" for what it really is), the fact that there's a pyramid out in the Nevada desert strikes some people as being weird. Why? There's at least one down the road in Vegas and it's several orders of magnitude larger than this tiny berm. And like Mick mentioned, if people see something at "Area 51" and it looks odd they often jump straight onto the alien conspiracy bandwagon. Any links to such hypotheses? I'm curious as to their thinking. Sure -- I'll update the OP shortly with some links. I've added your links. I need to change some stuff around so thread starters can edit the OP for longer. What's the purpose of the berm though? Is it just the left over dirt from the tunnel? And what's the estimation of size? The speculations all claim it's 'gigantic' but in the ground level photo it doesn't appear to be. To me, Pete, it looks like a bunker for testing jet engines.. the "tunnels" you see look like exhaust channels, especially the way they appear to taper outwards at the end. The top berm looks like it is housing the bunker. The pyramid is probably for testing purposes. There looks what could be steps leading up the back. Just my guess, but the shape of the pyramid could be so pressure waves pass by easier so testing/measuring equipment can be placed on it. If you're trying to measure pressure waves at different heights you would need a way to mount them at different heights. Key word in the name of the BEEF facility is Experiment. 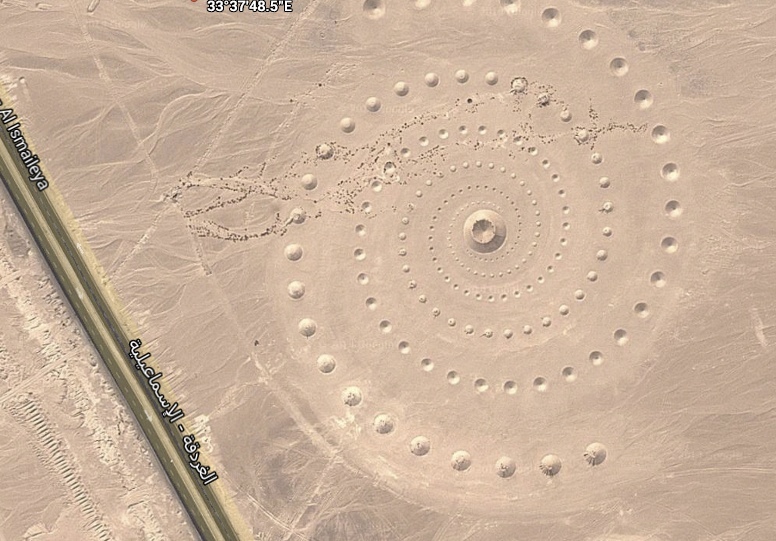 between the video beginning (I only got through about 30 secs ; ) and the old google earth images, the pyramid is the least weird thing in the area!! Here's another DoE document promoting BEEF, showing the Physics Trailer parked inside the earth-covered tunnel and the gravel firing table. 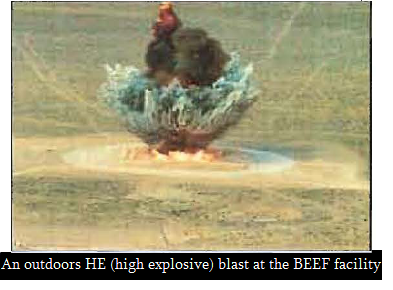 Mission: BEEF is a High Explosives (HE) and Pulsed Power test bed for experiments sponsored by the NWL's. BEEF was initially calibrated for 5,000 lbs. HE experiments; BEEF has been calculated to withstand 70,000 lbs. of HE. Physical Description: BEEF is a nine acre site which is remotely located in Area 4 of the NTS approximately 30 miles north of Mercury, NV. This facility is an HE testing site, currently supporting the LLNL Pulsed Power program. BEEF provides a 60 ft. x 60 ft. HE firing table, which has been excavated five feet and then filled with pea gravel to decouple the explosive shock wave from surrounding structures and improve worker safety. Surrounding the firing table edge are three steel enclosures referred to as Blast Enclosures, approximately 30 ft. long and 12 ft. in diameter, weighing in excess of 100,000 lbs that support various diagnostics and electronics. There are two operational underground bunkers; the 4-300 Control Bunker houses control systems and diagnostics, and the 4-480 Camera Bunker dedicated to fast framing and image converter cameras. 400 ft. west of the firing table is a 39 ft. high dirt pyramid commonly called the "get lost dump" which captures explosives ejecta and deflects the detonation wave. 500 ft. north of the firing table is a 24 ft. diameter; corrugated steel pipe with a 10 ft. dirt overburden housing the 60 ft. x 12 ft. Physics Trailer, No. 987 used has a common office and assembly space for workers during HE operations. The entire facility is surrounded by an 8 ft. chain link fence and all access gates are locked and controlled. Power is supplied to the facility from the 4-01 Substation, located 7,000 ft. to the north. Potable water is transported in for the water chilling system. Telephone communications are supplied by Verizon and radios are provided by NSTec. Cameras for the firing table, the facility and the access road are part of the facility and supported by NSTec Imaging. I suspect that the misconceptions surrounding the size of the pyramid are the result of people attempting to extrapolate it's dimensions via the Google Earth ruler tool. As you can see from the ground photos, the pyramid is much longer than it is higher, so measuring one edge from ground to apex will yield the faulty "gigantic" proportions that people have been claiming. The Google Earth ruler is very accurate and can be used to measure width, length and distance from an orthogonal perspective, but because of the angle of the satellite taking the images with respect to the ground, trying to measure the height of something will often give incorrect results. It's a large pile of dirt, but it falls short of the 20m height people take from the Google Earth ruler. Jet engines are tested in cells, which are basically warehouse units. A duct will lead outside to a right-angle diverter which will point straight up. If altitude tests are simulated, this requires a power station, (massive) pump units, and hundreds of feet of large-diameter ducting preceding it. It reminds me a lot of an American research facility created at the onset of WW2 to investigate the reliability of proximity fuzes. An originally-British invention, such an establishment improved fuze reliability from about the (typical) British 4% to a nice American 99.7%. Twenty million were made by 1945, and they undoubtedly contributed dramatically to the winning of both air and land wars, as all enemies were strategically and tactically totally unaware of their existence. Oh, yes. The shells were fired straight up. 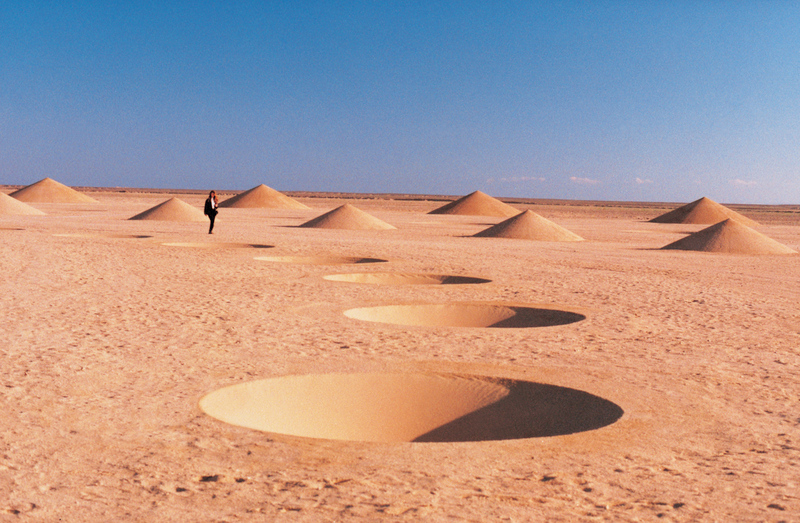 Mostly craters from explosives tests. It was aliens!! 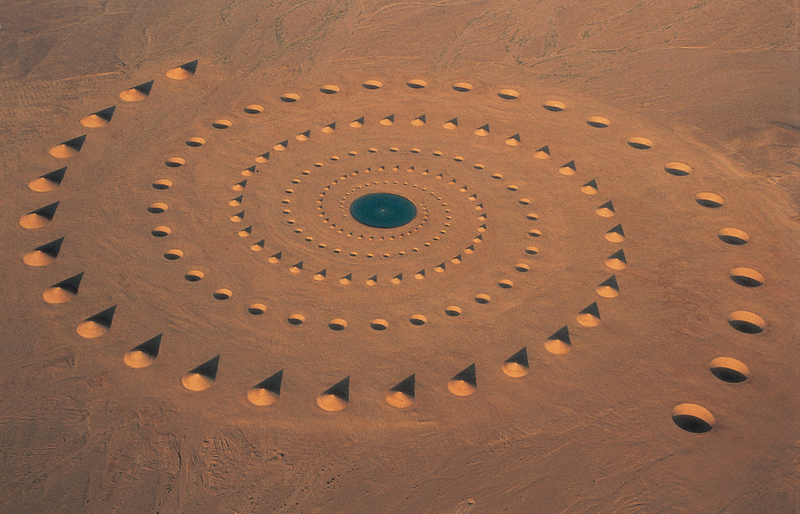 It;s exactly the same kind of spiral of circles I saw at the Stonehenge Crop Circle in 1996.